Windows Operating System contains lots of advanced features (like Automatic Maintenance Feature in Windows 10), if you are a Windows desktop or laptop user then there is no other operating system available that could make you satisfied. There are many eye-catching features available that make Windows operating system powerful, attractive and convenient. these two versions of the operating system are really very advanced and popular among every type of users i.e. home users and professionals. In this blog, we will discuss about a useful feature of Windows 10 & 8.1, as we know that Windows OS is packed with lots of practical tools. Automatic Maintenance Feature in Windows 10 is one of the well needed inbuilt tools that are responsible to maintain the performance of any computer or laptop. This inbuilt utility is scheduled to run on a daily basis and execute different computer maintenance activity in the background. updating Windows software and installed apps, attending to Action Center messages, Disk Defragmentation, Disk Volume Errors, System Diagnostics, running background maintenance task and more. And the plus point is, without impacting the performance of computer system or laptop. 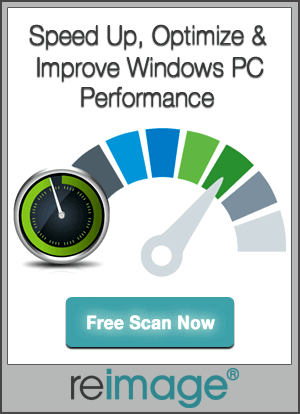 Also Read: Develop Your PC Speed With Disk Defragmentation and Cleanup! 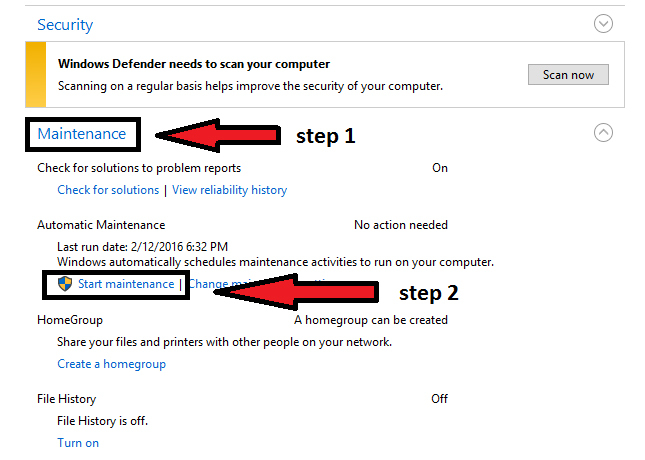 For enterprise workstations, this Automatic Maintenance Feature in Windows 10 contains enterprise-level Network Access Protection scanning and security standards scanning suitable for all enterprise workstations. In the Windows 10 and Windows 8.1, Automatic Maintenance is executed on daily basis. It runs all the factors that can affect Windows system and make them slow. The automatic maintenance process runs in the system background and doesn’t impact performance. A user can easily control the maintenance activity scheduling and configuration too. 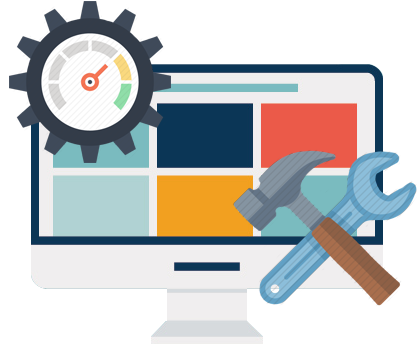 Automatic Maintenance is programmed by the Microsoft’s engineers to address various types of problems that affect the Windows system performance. Automatic Maintenance Feature in Windows 10 is set to on by default and designed to start its tasks on a daily basis at a time the user be likely to not use his computer or laptop. However, if user is busy with their computer at that time, then this advance maintenance feature will wait until the next time it detects your computer idle and get to work. Automatic Maintenance Feature in Windows 10 is turned on by default but you can turn it off according to your requirement. Microsoft has provided the functionality to manually turn on / turn off automatic maintenance in Windows 10. 1: Open Control Panel and click on System and Security. 2: Click on Security and maintenance-> click on Maintenance to expand it. 3: In order to turn off automatic maintenance: Click on the Stop maintenance. Take help from the below-given image. 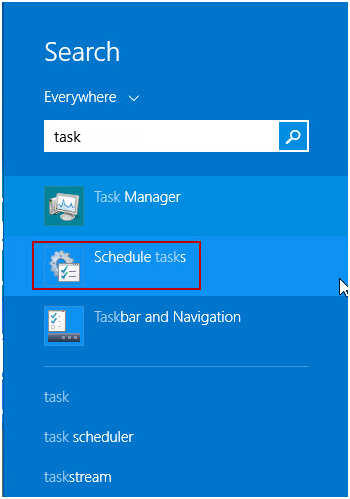 1: Go to the search option and type “task” or “schedule task” and click on the Schedule Task application. 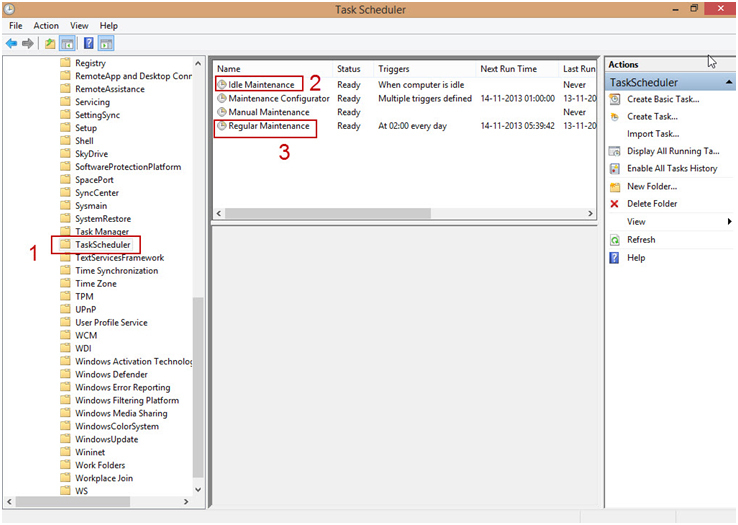 2: Task Schedule application will open, in the left panel you need to expand the tree structure Task Schedule Library -> Microsoft -> Windows. 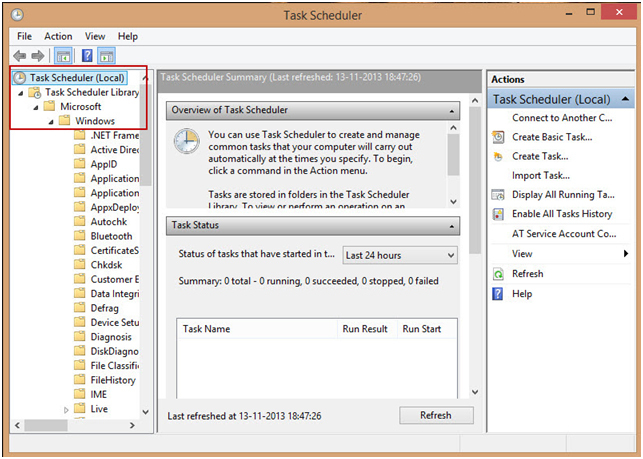 Choose TaskScheduler from it. 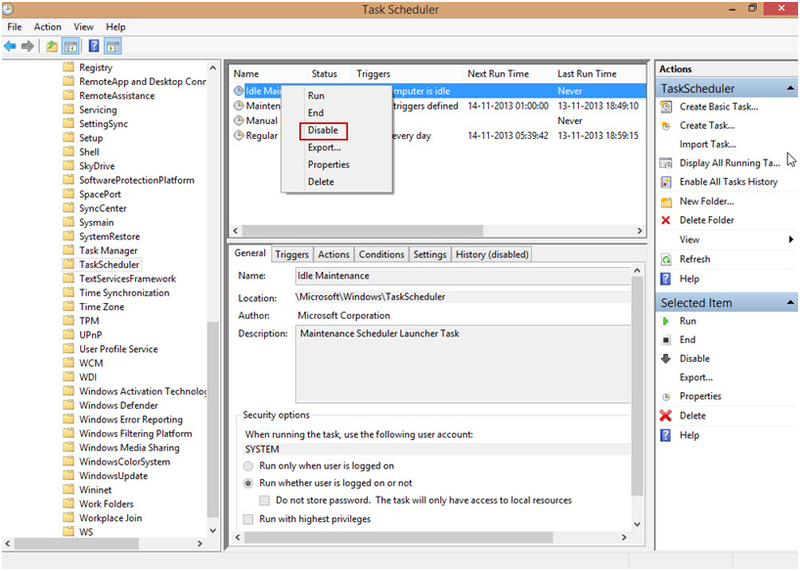 3: Now, at the right panel you need to click on TaskScheduler. 4: At last, Turn Off the Automatic Maintenance by right click over the Idle Maintenance and Regular Maintenance and choose Disable. 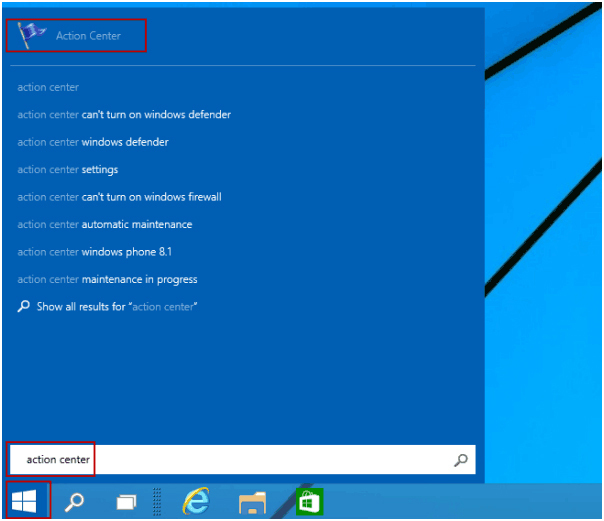 Steps to Enable Automatic Maintenance in Windows 10 and 8.1! According to my opinion, it is strongly suggested to never turn off features like automatic maintenance, Windows Firewall, SmartScreen and other. As all of these features are specially designed by the Microsoft to prevent Windows computer and laptop from slow performance, errors, outdated issue, harmful and malicious software/malware. So, make sure that these recommended features are always set to on, if not then turn them on again and Play it safe! 3: Enable automatic maintenance: Click on the Start maintenance option. Take help from below given image. 4: At last, Turn on the Automatic Maintenance by right click over the Idle Maintenance and Regular Maintenance and choose Enable. This becomes necessary when you turn off some system settings like automatic maintenance, Windows Firewall SmartScreen and other. As Windows automatically verify for any issues of Windows Update, Network firewall, Windows Troubleshooting and other items, and if they are turned off or any problem found then shows a message. If you would like to hide or show such messages on your PC, then follow the below given guide. 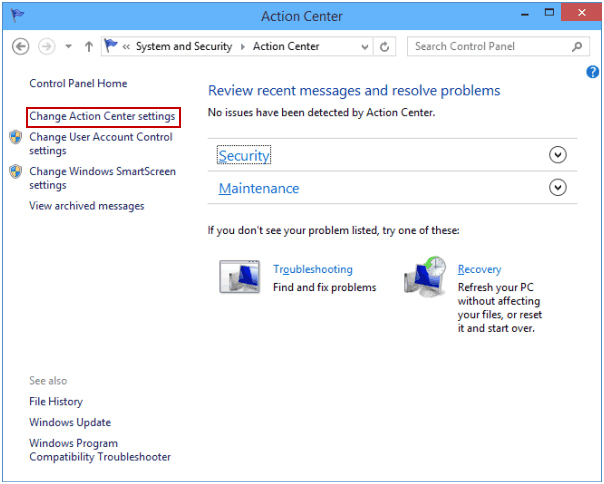 1: Click on the Start button, type action center in the search box and select Action Center from the result. 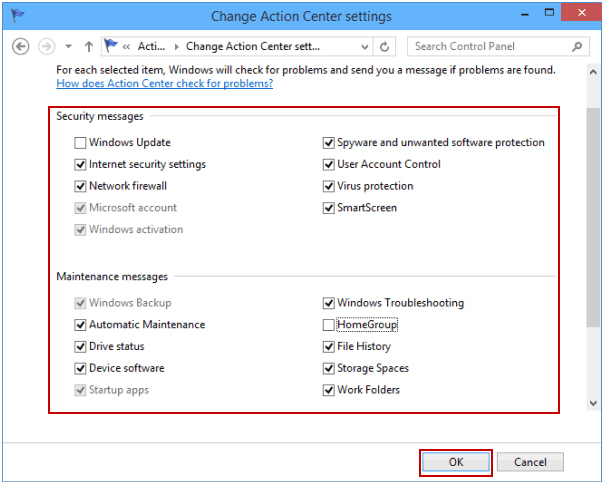 2: Go to the Change Action Center settings present on the left. 3: Now you need to deselect or uncheck security and maintenance messages of the items provided, and click OK. Choose items displayed in Security messages and Maintenance messages, and then click OK. Here are 3 simple tips to make your system error free and fats. To make sure that your system drive has efficient free space, go to Computer > Right-click on Local Drive > Go to Properties. Here you will see how much your system drive is free; if it is mostly full then you should remove all the unnecessary programs and files from the drive. Uninstall unwanted software or app from the system. Move any large file from desktop to other drives. Go to the Start>All Programs > Accessories/Administrative tools > Disk Cleanup. A window will appear, select what you want to delete. Check all the boxes excluding the game files and setup files. In order to get rid of the temporary files and needless system files and clean up your hard drive space automatically you can also try a professional tool. Open My Computer > Right-click on your main drive > Select Properties > Go to the Tools tab and select De-fragment Now/Optimize and De-fragment. Apply this action after every 2 or 3 weeks, this will maintain the health of your system hard drive. >>Is it necessary to turn on Automatic maintenance always? Yes, it is recommended to do that in order to avoid slow performance any kind of system error. >>At what time scheduled maintenance works? By default the automatic maintenance runs at 3AM or 2AM every day. And the daily limit is set to 1 hour which means this service will run no longer than 1 hour per day. >>How do I completely turn off automatic maintenance? Go to the search box and type Task Scheduler. 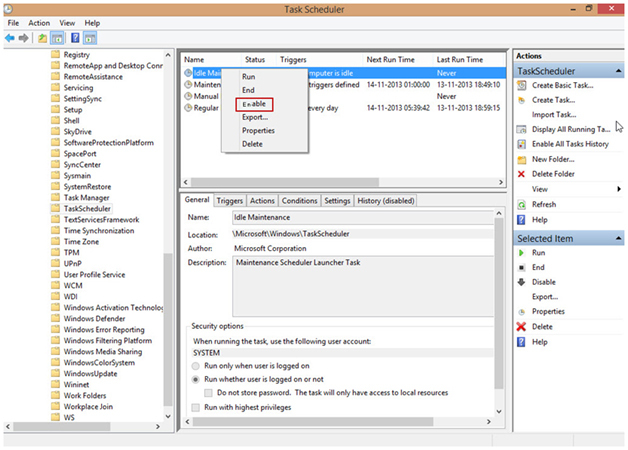 Select Task Scheduler, Microsoft, Windows, Task Scheduler. Right click on the Idle Maintenance& Regular Maintenance and choose Disable. Exit from the task scheduler. Choose disable on all off the options after disabling choose delete. >>What will happen when Automatic maintenance is turned to off? After few days of disabling automatic maintenance feature your system will start responding slow as system gets unable to maintain your system automatically. 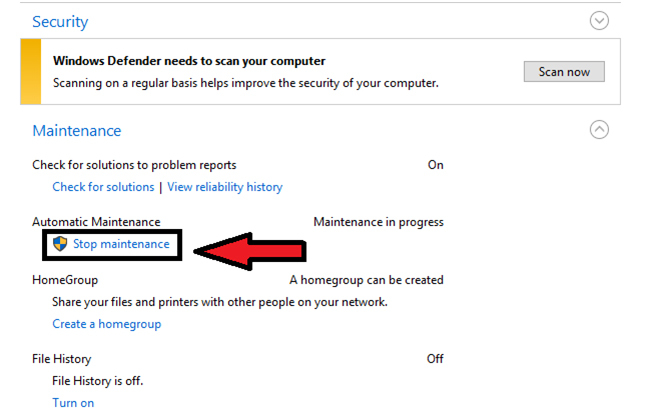 Know all about Automatic Maintenance Feature in Windows 10, how to disable Automatic Maintenance in Windows 8.1,Turn on Automatic Maintenance and more.